What is Intrinsic Protein Fluorescence? Proteins, including protein crystals, can fluoresce without any dyes or markers if it contains the appropriate amino acids in high enough concentrations and is excited with the correct wavelength of ultraviolet light. The amino acid tryptophan has the strongest fluorescence quantum yield of all of the amino acids found in proteins. The rest either do not fluoresce at all or only fluoresce weakly. Therefore "Intrinsic Protein Fluorescence" usually refers to the fluorescence emission of the tryptophan amino acid units. Intrinsic protein fluorescence is caused by exciting the protein with 280 nm ultraviolet light and observing at approximately 350 nm. However, the actual emission wavelength can vary depending upon the polarity of the environment containing the tryptophan. Like any fluorescent process, protein fluorescence is very weak and can be non-existent depending upon the protein structure and environment. The tryptophan emission can be quenched by other amino acids in adjacent positions in the protein, by the solvent or by impurities. Even the location of the tryptophan in the three dimensional structure of the protein as a whole can make a difference. 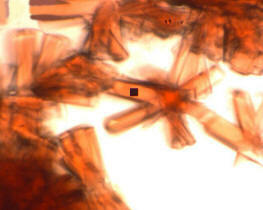 Most commonly, protein crystals are imaged by their intrinsic protein fluorescence. This requires either very powerful ultraviolet light sources or very sensitive cameras because the fluorescence emission from proteins is very weak. However, both of these paths have drawbacks. A very powerful UV light source can cause the protein to denature and therefore destroy the crystal or sample. And long exposures required by cameras mean more exposure to harmful ultraviolet energy as well as making the imaging process more time consuming. Both of these considerations also make in vivo imaging impossible. As stated earlier, imaging of intrinsic protein fluorescence is done by exciting the protein with 280 nm light and using the camera to capture the photons emitted at 350 nm. A picture is then built up over time. This can be done with either a ultraviolet microscope or a microspectrophotometer equipped for UV imaging. Of course, Green Fluorescent Protein (GFP) and biological samples that contain fluorescent markers or dyes can be easily imaged by ultraviolet microscopes and microspectrophotometers. As these systems have enhanced operation in the UV, exposures can be correspondingly shorter and images brighter than with a standard microscope. CRAIC Technologies microspectrophotometers are used to acquire spectra of microscopic protein crystals by intrinsic protein fluorescence. This is done by integrating a ultraviolet light source and special UV optics in a custom built microscope with a very sensitive spectrophotometer. Microspectra™ of intrinsic protein fluorescence is collected by exciting the protein with 280 nm light and using the spectrophotometer to capture the photons emitted from 300 nm to the near infrared. Microspectroscopy allows the scientist to learn more about the optical features and the chemical structure of the protein. Microspectrophotometers are also used to analyze proteins samples that contain fluorescent markers or even such samples as Green Fluorescent Protein. A microspectrophotometer can easily distinguish between different dyes due to its high spectral resolution so multiple dyes can be used on a single sample. Intrinsic protein fluorescence is usually due to the fluorescent emission of tryptophan when excited with 280 nm light. It can be used to image proteins both in solution, cellular structures and in crystals. However, intrinsic protein fluorescence is very weak, will not exist in proteins without tryptophan, and is easily quenched. However, imaging of intrinsic protein fluorescence is the most common technique in isolating protein crystals from salt crystals. Green fluorescent proteins also exhibit fluorescent emission with UV excitation and are easily and quickly analyzed by both imaging and microspectroscopy. Proteins with fluorescent dyes are analyzed in the same manner.